WHO SAYS THERE'S A BACON SHORTAGE? IN THE NEW SEASON OF "FOOD PARADISE"
This week's headlines predict a shortage of pork and bacon in the global markets next year due to poor harvests not supplying pig herders with enough feed. But there's no shortage of bacon on Travel Channel as it kicks off a new season of the weekly half-hour series "Food Paradise," premiering on Wednesday, October 3 at 10:00 p.m. ET/PT, with the episode aptly named, "Bacon Paradise 2: Another Slab!" In "Food Paradise," Travel Channel has compiled all the must-see spots across the country to have a one-of-a-kind dining experience. Fantastic food is often-times more important to many travelers than museums, hotels, and souvenirs, and the network is serving up hefty plates of the country's tastiest, most mouth-watering, and decadent meals. 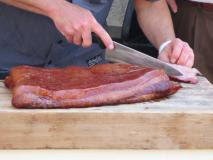 In the premiere episode, the focus is on bacon. And after watching this episode, viewers may be inspired to bring home the bacon and put it in frozen storage in preparation for the anticipated 2013 shortage! Bacon is not just for breakfast anymore. Every year, American restaurants serve more than 1.7 billion pounds of cured pork belly in everything from cocktails to dessert. "Bacon Paradise 2: Another Slab" celebrates the art of sizzling swine beginning with a bacon bastion in Austin, Texas that's actually named Bacon. In addition to curing and smoking their own bacon and coming up with new concoctions every day, they serve up their signature Bacon Reuben. Then in Boise, Idaho, viewers will discover John Berryhill's Bacon, where they make a killer bacon lasagna. 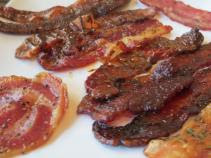 In Santa Rosa, California, the audience will learn about gourmet black pig bacon, before heading to Grub in Los Angeles to find breakfast bacon so addictive, they call it crack. Continuing on to Chicago, a pub called Paddy Long's is famous for their beer-and-bacon pairings, as well as a five-pound concoction of bacon wrapped around sausage dubbed the "Bacon Bomb!" From there, bacon-lovers head down the street to the Chicago forum for the city's annual bacon-fest, where prime purveyors of cured pig compete for the coveted Golden Rasher, which is awarded for the most creative use of bacon. In Denver, a restaurant called The Berkshire has created a peanut butter, banana and bacon King Sandwich in homage to Elvis Presley. And the bacon round-up concludes in New York City with The Baconery, where bacon and baked goods collide! No matter how you slice it, bacon's salty, smoky flavor can elevate any meal to porcine perfection.